This is the last complete surviving and operational Moonrocket. These rides were the ultimate thrill ride of the 1930s, with this example being delivered to John Shaw of Lancashire in 1939. Originally it featured on the front a rocket carrying characters such as Popeye, Groucho Marx, Stan Laurel and Oliver Hardy – though this has long gone. Riders sit in small rocket shaped cars that swing out when going round on the ride, which is also inclined to make it more intense. Whilst the ride is capable of doing 16rpm the central dome and the figure on it can rotate the other way – making it seem a lot faster and playing with your mind. The artwork on the ride dates from the 1960s and was painted by Andrew Easton of Maxwell’s in a psychedelic style based around nuclear explosions and acid shades of colour. This is the only known ride to retain such artwork to this day. 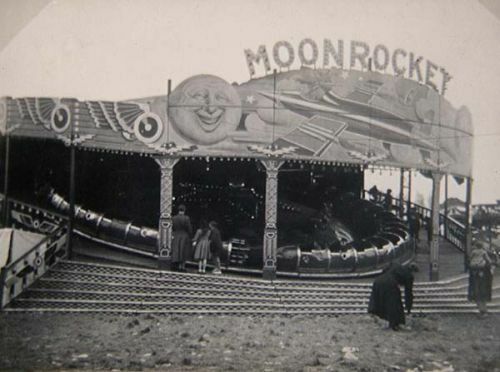 The ultimate white-knuckle thrill ride of the pre-war era, the Moonrocket first opened in Britain in 1937, and enjoyed tremendous popularity in the late 1930s. It was fast, streamlined and futuristic. It would, after all, be another 30 years before man set foot on the moon. Shaw’s Moonrocket was built by the partnership of Robert Lakin and George Maxwell, making its debut at Seaforth Easter Fair in 1939. The Shaw family travelled in Yorkshire and Lancashire. It was John Shaw, son of the founder of the of the business, who had the ride new. The impression of speed on the Moonrocket was increased by having a counter-rotating centre dome, and on this was a figure of Popeye astride a rocket. The ride spent much of 1939 at Ramsgate, but returned north when war was declared in September. The front boards were decorated by Edwin Hall, and depicted a rocket with its load of passengers, including some well-known cartoon characters, perused by a witch on a broomstick. Speed-wing designs adorned the rounding boards while there were space-scenes on the shutters. It was John’s son, Walter, who travelled the ride for many years. In the 1950s he saw the potential for the ride to be even more of an attraction, and it was sent back to Maxwells at Musselburgh, who replaced the original ‘fixed’ rockets with swing-out cars. Now themed as the Space Cruisers, the original decoration on the front was replaced by Dane Dare type rockets. The Moonrocket was redecorated again in 1967 with the paint work which can be seen on the ride today. This was done at Maxwell’s workshops in Musselburgh. During the 1970s Walter Shaw’s son, John Walter, became involved in travelling the ride. In the 1970s the cars were repainted by Andrew Easton and Tate Décor, and two gigantic spacemen from Blackpool Illuminations added to the front. By the 1970s it was the only Moonrocket still travelling in the country, and it was clear that travelling such a massive ride was becoming increasingly difficult. It required two lorries and three trailers, including the centre truck, and a team of men to handle it. 1982 was to be the last season the Moonrocket travelled, and shortly afterwards it was sold to Philip Knightbridge, who planned to restore it. In 1992 it changed hands again, and in the ownership of Howard Maden it underwent one of the most thorough restoration projects ever undertaken on a fairground ride. It made its debut in 1994 and attended various events over the years, but sadly in 2012 Howard passed away. It was the wish of his family that the machine came to the Fairground Heritage Centre, as they wanted to see the ride enjoyed by the public, and so after negotiations and a grant from the National Heritage Memorial Fund it was acquired and brought down to the museum ready for the 2017 season. Even eighty years on, the Moonrocket is a thrilling, white-knuckle ride, and stands a tribute to the craftsmanship of that era.